Gary has a selection of his own highly successful fly patterns which are available to order. He can also tie any fly you want, all he will need is either a sample fly or for you to send him the dressing details. 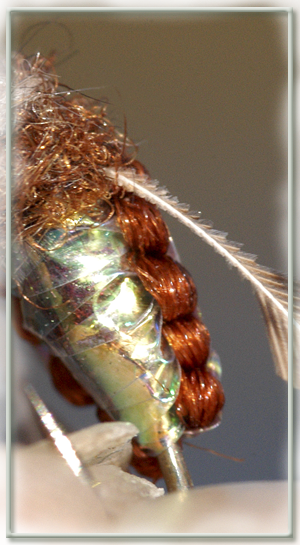 Dries, Emergers, Nymphs, Buzzers, Wets, Filo, Lures, Salmon (all sorts), Pike and Saltwater flies are all tied to existing patterns, Gary's own design or custom tied to your requirements. All flies are tied using the finest quality materials available and are tied on premium quality hooks. As Gary is a fully qualified fly dressing instructor you can be sure all flies will be tied to the highest possible standard. Please contact Gary to discuss or place an order. Gary ties all types of dry fly to order, the flies above are just a small sample to illustrate the quality of the dry flies he offers. Emergers are often the most successful flies to fish for Trout with, Gary can supply you with flies proven to catch when fish are keyed on emergers. There are times on Loughs and Stillwaters when only buzzers will do, Gary's buzzers, like all his flies, are tied to exceptionally high standards. From traditional quill winged wets tomore modern designs, Gary can supply any you want. Many of the Filo flies Gary offers are tied to his own design and have proven themselves a revelation with many big fish finding the movement of the Filoplume irresistable. Staple stillwater favourites many lures are also proving effective on rivers when conditions make fishing other types of flies difficult. Why not give it a try with Garys lures? You may be pleasantly surprised with the results. Planning a Salmon fishing trip to Ireland? Gary's Salmon flies have brought many fish to the net on Irelands finest Salmon waters as well as further afield. Gary ties and fishes all types of Salmon flies. With 700 teeth Pike can make short work of poorly tied flies, Garys Pike flies are tied to last fish after fish. Saltwater fly fishing has for a few years now been one of the fastest growing branches of our sport. Whether you need flies to fish on Irish & UK shores or for a trip chasing tropical species Gary can supply you with the flies you need.